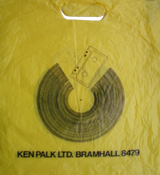 Ken Palk had record shops in Bramhall (in the precinct) and Knutsford. I didn't know the Knutsford shop but I bought my first record in the Bramhall branch circa 1988. Comment: Natalie Ainscough.